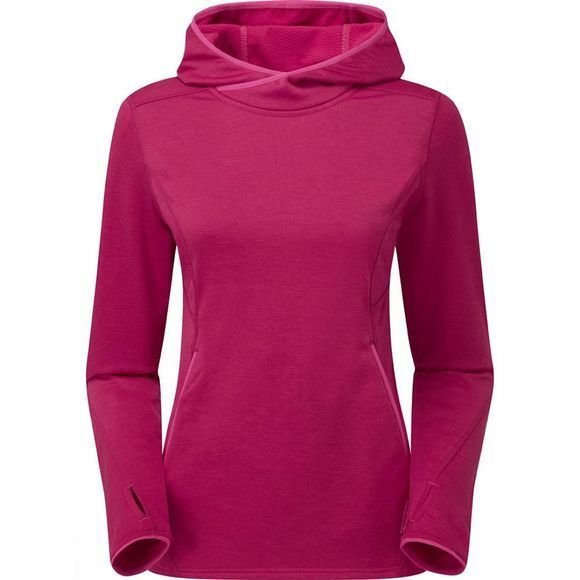 Super soft and fast drying V-Marl Stretch Fleece fabric with a soft brushed internal face gives the Women's Sirenik Hoodie Pull-On an excellent warmth to weight ratio. A snug, protective stretch bound hood provides protection from the elements, while a single large kangaroo pocket keeps your hands warm. There are also low profile stretch bound cuffs with thumb loops to keep your hands warm, however the most ingenious feature has to be the internal concealed zipped pocket for coins, cards & valuables. Montane's Sirenik hoodie is the ideal choice for travelling!